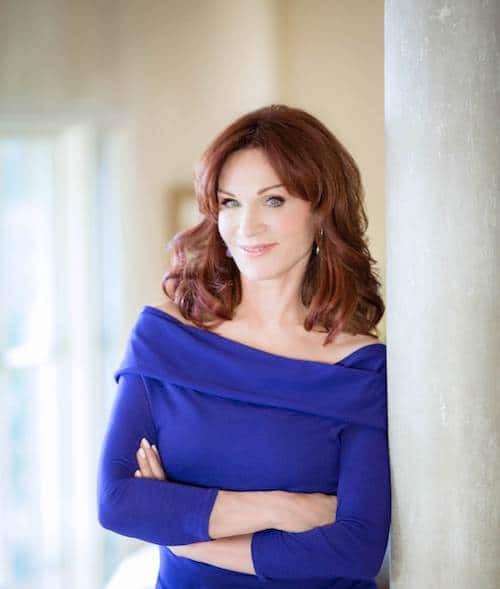 You may know five-time Golden Globe nominated actress, Marilu Henner, for the diverse and memorable characters she has played on stage, television, and in film over the past four decades. Whether she is starring as Elaine O’Connor Nardo in Taxi, appearing as Aida Teagarden from Hallmark Movies & Mysteries’ Aurora Teagarden Mystery series, or performing live on stage in her recent return to Broadway as Mitch’s Mom in Gettin’ the Band Back Together, Henner always injects vibrant passion and energy into the roles she plays. But perhaps the most personally important role she has ever played in her lifetime was that of caregiver to her husband during his battle with cancer. Like sun and moon, Henner and her husband, Michael Brown, orbited around each other for many years before finally coming together. This trend of almost connecting began when Brown was her freshman roommate’s boyfriend as the two first became acquainted at the University of Chicago. She remembers being drawn to him early on, “Although I felt a jump the moment I saw him, since my roommate met him first, I would never break the ‘girlfriend code’ and I didn’t dare twinkle in his direction.” But they all eventually became really good friends and often would even go on double dates during that time. When Brown and Henner’s roommate broke up during their second year of college, Henner continued to keep her distance from him out of respect for her friend, but they still would share occasional waves and passing glances around campus—perhaps a subtle portent of their future relationship. Time passes again, and Henner has two beautiful sons with her second husband of sixteen years. Then, fifteen years ago, the perpetual gravitational pull of these two finally cause them to joyously collide when Brown called her out of the blue. “Within a month we’re saying ‘I love you’ and that we’re going to spend the rest of our lives together,” she adds. Henner immediately took a proactive position to help Brown as his partner, caregiver, and healthcare advocate. Together they opted for Brown receiving non-traditional immunotherapy treatment instead of chemotherapy, radiation, and bladder removal. They also co-wrote a book about this journey entitled, Changing Normal: How I Helped My Husband Beat Cancer, which discusses caregiving, how much the human body wants to heal, and how immunotherapy is the wave of the future. Directly related to this, Henner states the need for caregivers to be educated about their loved one’s affliction. “Don’t just go on the websites that have one page beyond the front page of any disease that you are researching—I think it’s really important to tool around and get as much data as you possibly can under your belt so you can start to cross-connect the information that you’re learning in order to see what works for you.” She adds it is especially important to gather enough information in your brain so that you can figure out your path, because everybody’s path might be a little bit different. Dr. Herbst adds that caregivers should never have to go through the cancer journey alone. “It can help to talk to other people who have gone through similar situations, whether it be family, friends, or a local advocacy group like the Lung Cancer Alliance.” The Lung Cancer Alliance’s website provides access to excellent information for caregivers (like Henner’s TIP SHEET) that may be helpful throughout the journey. You can read more of Christopher’s work at cussat.com.